Candice Swanepoel is a South African model and philanthropist. She is known for her work with Victoria’s Secret. Candice’s resume includes covers for Vogue (Greece), ELLE (Germany), and Ocean Drive (U.S.), and advertisements for Nike, Diesel, Guess?, and Versus Eyewear. She has walked the runway for Tommy Hilfiger, Dolce & Gabbana, Sass and Bide, Betsey Johnson, Diane von Furstenberg, and numerous other designers, as well as for Victoria’s Secret. Candice is the daughter of Eileen (Green) and Willem Swanepoel. 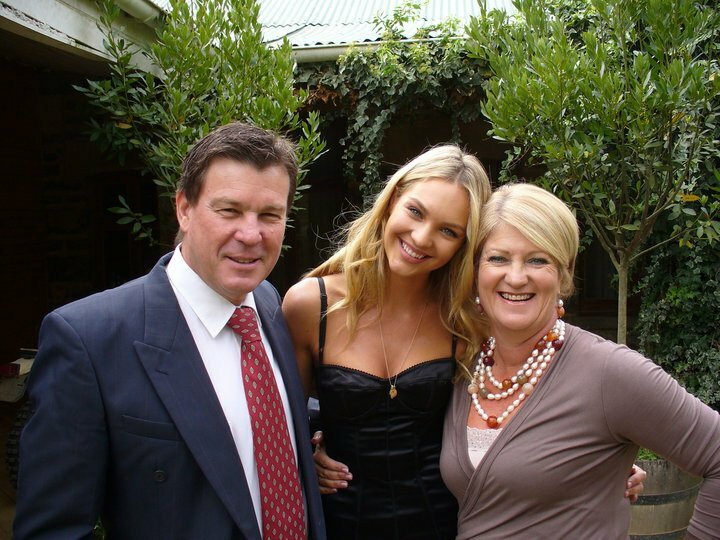 A picture of Candice with her parents can be seen here. Candice has a son with her fiancé, Brazilian model Hermann Nicoli. Candice’s ancestry includes Afrikaner (Belgian [both Flemish and Walloon], Dutch, French, German), with distant African (Angolan and Ethiopian), English, Indian, Indonesian, and Norwegian descent on her father’s side, and English on her mother’s side. Some of Candice’s ancestors were African, Indian, and Indonesian slaves. Candice’s patrilineal ancestry can be traced back to her ninth great-grandfather, Jan Andries Swanepoel. Candice’s paternal grandfather is Jan Andreas Swanepoel (the son of Johannes Willem Swanepoel and Petronella Johanna Susana Fouché). Jan was born in Delareyville, Ngaka Modiri Molema, North West. Johannes was the son of Jan Andreas Swanepoel and Cornelia Susanna Johanna Meyer. Petronella was the daughter of Louis Joachim Fouché and Aletta Johanna Susana Esterhuizen. Candice’s paternal grandmother is named Susanna Magdalena Cornelius. Susanna was born in Lichtenburg, Ngaka Modiri Molema, North West. Candice s a seventh cousin, once removed, of runner Oscar Pistorius. She never looked quadroon or octaroon to me or part black for that matter. To me Behati looks more possible SSA influenced then Candice. Her non European ancestry must be very small at least in phenotype. Genetic wise she could be more mixed then it seems..
Based on 23andme, it is common for white South Africans to have distant African/Indian/Indonesian/Chinese ancestry. Behati Prinsloo, Anrold Vosloo, F.W. de Klerk, Johannes de Klerk, P.W. Botha, B.J. Vorster, etc. also have this ancestry. Charlize Theron, Elon Musk, Embeth Davidtz, Oscar Pistorious, Reeva Steenkamp, Sharlto Copely, Madelaine Petsch, Sasha Pieterse, etc. probably do as well since white South Africans are very inbred. However, it is very distant, as in from hundreds of years ago, and they usually score 1% or less on 23andme. My point was that they are definitely not octoroons or quadroons. If you look at the genealogy, Candice and Behati’s ancestry is from hundreds of years ago. I see the African in her. Its subtle but noticeable to me. I don’t see it. She just looks Dutch to me. Many Afrikaaners can have African in them but it’s usually too small a percentage to be noticeable. Candice is probably an octoroon at most and even then her parents look passable as being fully “white”/European descent imo. Whatever ssa must be very subtle and almost unnoticeable to the average person. Yes, her parents “pass” as White Europeans. Octoroon? Based on that genealogy, she isn’t. Candice’s ancestry includes Afrikaner (Belgian (both Flemish and Walloon), Dutch, French, German), with distant African (Angolan and Ethiopian), English, Indian, Indonesian, and Norwegian descent on her father’s side and English on her mother’s side. Some of Candice’s ancestors were African, Indian, and Indonesian slaves. Candice’s patrilineal ancestry can be traced back to her 9th great-grandfather Jan Andries Swanepoel. which is the name of her last Ethiopian ancestor? I forgot her name. Maybe, you should look her genealogy. But, she came from Abyssinia. She was captured either in Horn of Africa or Madagascar. Then, she was traded as a slave. I asked because Ethiopia is far from SA. Btw Afrikaners score some Sub-Sarahan African and South Asians on genetic tests, so that’s not a big deal. Wow, what a biased site – This information hasn’t been verified but you posted it as fact on your bio page. What nonsense. Could you be more accurate about these ancestors? She is the daughter of Eileen (Green) and Willem Swanepoel. She is engaged to Hermann Nicoli. Candice is the seventh cousin once removed of Oscar Pistorius. Candice’s paternal grandparents were ? Swanepoel (the son of Johannes Willem Swanepoel and Petronella Johanna Susana Fouché) and ? Cornelius. Johannes was the son of Jan Andreas Swanepoel and Cornelia Susanna Johanna Meyer. Petronella was the daughter of Louis Joachim Fouché and Aletta Johanna Susana Esterhuizen.